Free Download Pirate Poppers Game or Get Full Unlimited Game Version! Ready for some swashbuckling fun? 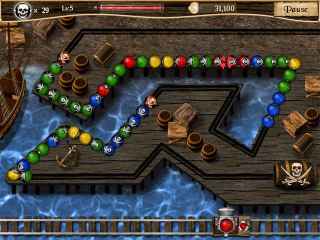 Aim your cannonballs to clear the chains while collecting pearls, jewels and trinkets that rain down from above! In order to get advantaged of playing Pirate Poppers full unlimiteg game version you must register the game. Avast ye mad dogs and scaliwags! Climb aboard this swashbucklin' sea farin' saga through 77 levels of pirate popping fun! Aim your cannonballs to clear away menacing chains while skillfully collecting valuable coins, trinkets and jewels to fill your Treasure Trove. Begin your journey as a lowly Landlubber and fearlessly plunder your way up the ranks to Scurvy Dog, Powder Monkey and beyond. Do you have what it takes to become a Living Legend? 77 Levels Of Swashbuckling Fun! 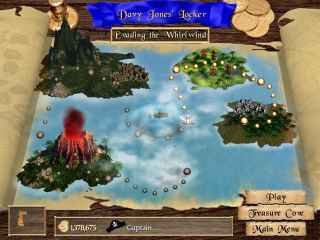 Follow a pirate’s treasure map in Pirate Solitaire, a fast-paced and fun Card game! Chain together combos to unlock treasures! Match your way over the seven seas as you follow the crazy adventures of pirates on their plundering journeys! Play Pirate Jigsaw and dive into romantic high-sea adventure where pirate treasure abounds on beautiful tropical islands. Pirate Jigsaw 2 offers 500 unique photos to transport you to a world of incredible adventure! Complete fun jigsaw puzzles and conquer the ocean! Relive the classic Match-3 mechanic, Caribbean Pirate Quest adds a new layer of skill to your Puzzle palette.